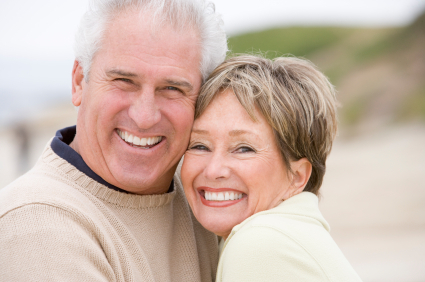 Victory Dental is proud to offer the latest in Denture technology in Boise, Idaho. Whether you are missing a couple teeth or need full dentures, Dr. Ripplinger has the solutions you need to enjoy your smile again. While loosing one's teeth can be devastating, dentures can provide a second chance at a beautiful smile. Find out more about the exciting advancements with implant retained dentures. With today's advancements in dental implant technology, many are looking into the extreme benefits for investing in implant retained dentures, especially with the increased lifespan enjoyed by seniors. Dental implants can provide a fixed solution to having removable dentures. They provide excellent support and stability for these dental appliances so you can smile and eat with confidence. There are some things you should know about removable dentures or partials before you make a final decision. 1. Removable dentures or partials will need to be adjusted or replaced about every five years. Once teeth are removed, the bone begins to resorb, shrinking the jawbone and causing the denture or partial to become loose. Inserting dental implants (artifical teeth roots) into the jawbone can slow the bone loss and make loose dentures a thing of the past. 2. Removable partials can actually cause wear or decay on the supporting teeth. With dental implants, the partial is fixed to the implant so there are no damaging effects on the remaining teeth. 3. You will most likely not have the same bite force with a removable denture as with an implant retained denture. Implants are solid and function like real teeth so you can eat with confidence. 4. If you wait to get implants down the road, it may be too late. Every day you wear a removable denture you are losing valuable bone mass. If enough bone is lost, dental implants will not be feasible. The process of getting dentures requires several appointments, usually over several months. You dentist will study your health history and images or your teeth and jawbone to determine the best treatment plan for you. Some teeth may need to be pulled to be able to create a solid partial or denture. While the area is numb, the implant will be surgically laced into the bone and allowed to heal and integrate into the bone for up to six months. During this time a temporary appliance will be worn. The artificial teeth are then made and fitted to the post portion of the implant, providing excellent stability and comfort to the patient. You will receive care instructions when your treatment is completed. Good oral hygiene, eating habits, and regular dental visits will aid in the life of your new dentures. Dentures from our office cost ~$1200 per arch. We often work with denturists who can provide dentures at a lower cost and a quick turnaround time. You will want to make an appointment at our office first to go over your options and make a treatment plan. Extractions and implants for retained dentures are often done in house. A simple tooth extraction costs around $100-150 per tooth and up to $200-250 if it becomes surgical. Dental implants run around $1700 each. Generally, you will want four implants to hold an upper or lower denture in place. The entire treatment plan cost varies greatly with each patient. We recommend you schedule an exam and consultation to receive a personalized estimate. Enjoy these informational videos to help you understand the denture and implant process.